Haul: HBC Great at P88 promo! 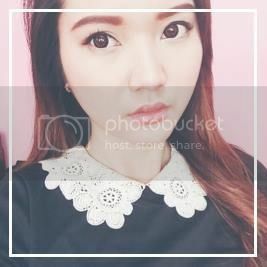 | misskatv.com: Haul: HBC Great at P88 promo! Haul: HBC Great at P88 promo! This is my biggest haul ever! and get the chance to avail the same promo that I got yesterday! 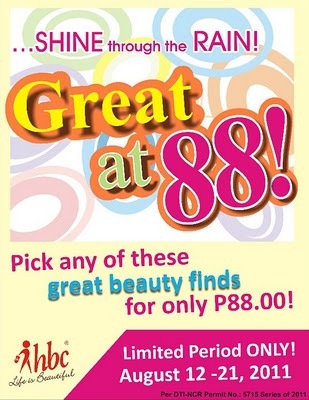 Their promo runs from August 12-21, 2011 only! So you still have 3 days to grab beautiful stuff! and some items are 2 for P88. HBC came up with products exclusively available to their stores. To highlight this move and bring it home faster to the consumer, on October 2002, HBC decided to rename its stores to HBC Home of Beauty Exclusives. In a few years time, HBC plans to make their stores a haven of exclusive, effective but affordable products that would be within reach of their customers. To date, HBC now has close to 200 branches and plans are now under way for its expansion in key trade areas nationwide and extending its reaches overseas, namely the United States of America. Truly there is no stopping HBC as we continue our journey becoming the Philippines leading innovative world-class retailer of health, beauty and personal care products. I personally love shopping in this store. Everything is affordable and they have great promos once in a while. They also give free services like facials for purchases above P250+ or more. Here are the things I've picked up yesterday! I got each item for P88 only. I got the Sunblock cream for 2 for P88 with another item. The other 2 item were P88 each. I really want to try the hair remover cream thingy. I never used one. I'm kinda interested on how it works. I also picked this Body Recipe Skin Protecting Hand Gel for 2 for P88 with another item. I got 3 of these Pure coco oil soaps which is also 2 for P88. I got myself some foot scrubs! Yeah, yeah, me and my cousins are addicted to it! Haha. which I also love especially the blusher! Eyeshadows sells 2 for P88 and blushers were P88 each. I won't forget picking up makeups from their SanSa line. I also bought polishes! 10 of them. Haha! I was so attracted with the colors! I have Sansan polishes in my collection and I really love them. I always use them in my nail art tutorials. So I bought almost the set of their pastel colors. These polishes are not included in the promo. I think this was sold for P37 each. I think this is new? The tiny little bottles from their Sansan line. It's so adorable but I hope they release more colors! P30 each as I can remember. and giving me the opportunity to avail your uber awesome promos! You can check out their Facebook page for updated promos and discounts. I'll be posting reviews and swatches soon. And I hope you go to your nearest HBC store and avail the promo. For international readers, please check their website if you want to order online. Super dami nang items ng HBC. I think HBC is splash also, i remember applying here before, but got an emergency that's why i didn't attend the final interview. Can't wait for your product reviews. id love to try these out! OH my! Now I'm really jealous! if only I have that much cash left...hehehe. All I can say is "DAMN!" That's an amazing haul, hun! wow thats an amazing haul!! Wow! I only bought 3 items from HBC last Wednesday. But I think I'll be going back to buy their hair remover and some of the Allue and San-San line. Hehehe! Hi dear! Your blog is amazing! I would be very honored to have you in my followers! woooooow =D such a huge haul !! to go to see the web page, that's what this web page is providing.